Is it selection, or the sorting of talents (Behrens et al. 2014) that leads only the most productive firms to locate in denser areas? Or do agglomeration economies explain why firms located in less dense environments are less productive? Empirical evidence suggests that the main driver of differences in productivity is not selection (i.e. tougher competition inducing less productive firms to exit the market) but agglomeration economies (Combes et al. 2012). The usual suspects are the higher availability of services, better infrastructure, sharing of public goods, a denser labour market allowing for better matching, and technology spillovers (Duranton and Puga 2004). Using firm-level data for France, we confirm in a recent study that misallocation has a spatial dimension: resource allocation and the associated effect on productivity are related not only to firms’ characteristics, but also to the environment in which they operate (Fontagné and Santoni 2016). Denser commuting zones seem to offer a better match between employers and employees. A key driver of productivity is ease of resource allocation. In a perfectly competitive environment, resources should flow freely from less to more productive firms, since those are most likely to survive in the market. However, there are several factors that can hamper this continuous flow of resources: recessions, labour and capital rigidity or adverse regulatory and competitive environments. The resulting resource misallocation implies that more efficient firms tend to be smaller than the optimal size while less efficient firms tend to be bigger than their optimum production scale. The dispersion of revenue-based productivity (the product of physical productivity and the firm's output price) has been used as an indicator of the degree of resource misallocation at the sectoral level (Hsieh and Klenow 2009). Alternatively, the gap between the marginal product value of each factor and its cost to the firm can be used as a metric of the degree of resource misallocation among firms within sectors. It measures the extent to which firms are not fully optimizing production (Petrin and Sivadasan 2013). Notwithstanding the distortions that are present in the economy as a whole, such as labour market rigidities, firms in denser areas should be able to match with more productive and better paid workers. In relation to the difference between the wage and the value of the marginal product, a better matching should reduce the gap between the two at the firm level. Using administrative data for the universe of legal units operating in the French manufacturing sector over the period 1993-2007, we show that this mechanism is at work: resource misallocation among firms within sectors is lower in denser French commuting zones. 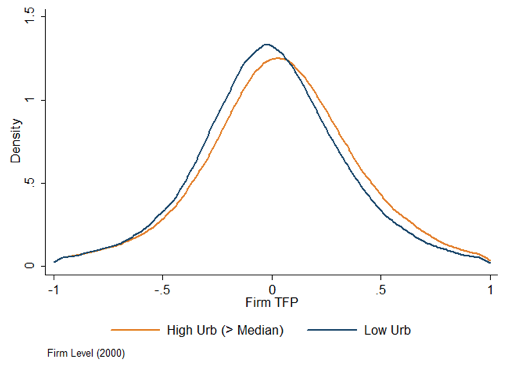 We illustrate this stylised fact by plotting in Figure 1 the density of firms' TFP for two firm categories in 2000 (in the middle of our time window) in commuting zones below and above the median urbanisation – the premium is 6.5% significant at the 1% level. For a given sector and year, we report in Table 1 the mean absolute labour gap, defined as the distance from the social optimum allocation, where each firm is operating with marginal revenue equal to marginal costs and no frictions in the input markets. For the whole manufacturing sector over the period 1994-2007 this figure is slightly above €8,700 per firm at 2005 prices, with dispersion relatively high both between and also within industries, as shown by the coefficient of variation (CV). Instead of using perfect competition (zero gap) as the benchmark, we are interested in knowing what the contribution to overall gains would be from achieving efficient allocation, i.e. 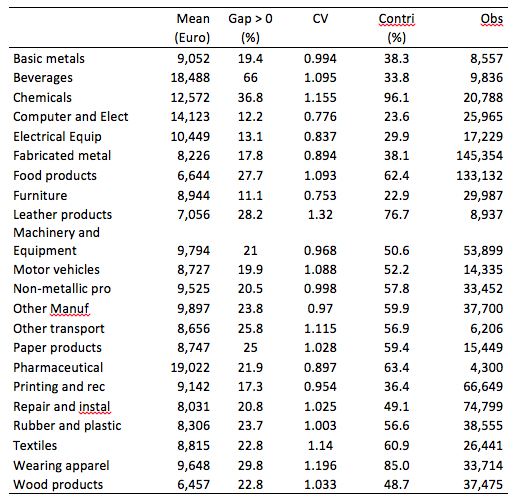 the existing gaps are equal across all firms in a given sector. This results from the loosening of market constraints which allows the reallocation of one unit of labour (i.e. the marginal worker) across firms without changing the employment level or the structural frictions. This information is shown in column 4 (‘Contri’). For instance, in the case of machinery and equipment, resource allocation inefficiencies determine 50.2% of the mean absolute gap, while structural frictions account for the other half of the overall gap. We finally investigate whether firms in denser areas exhibit lower labour gaps, controlling for firm productivity and export status. To do so, we focus on the matching channel efficiency, and test whether in denser areas the thicker labour market also favours firm resource allocation efficiency, reducing the return to cost wedge. We follow Martin et al. (2011) and define two indicators for each single-plant firm located in a given commuting zone and operating in a given sector: ‘Urbanisation’ is the number of employees in other industries within the same commuting zone, and ‘Location’, is the number of employees working in the same industry and the same commuting zone. However, we should be aware that that the typical worker in denser areas is more skilled. Worker sorting by skills across cities would thus induce attenuation bias in any OLS estimation. Our instrumental variable approach confirms the role of agglomeration: a 10% increase in the degree of urbanisation is associated with a decrease in the average gap of about €240 (out of a mean gap of €9,680). Instead, location has no impact: intra-industry externalities do not induce firm level efficiency. Behrens, K, G Duranton and F and Robert-Nicoud (2014), “Productive cities: Sorting, selection, and agglomeration”, Journal of Political Economy, 122(3):507-553. Combes, P-P, G Duranton, L, Gobillon, D Puga and S Roux (2012), “The Productivity Advantages of Large Cities: Distinguishing Agglomeration from Firm Selection”, Econometrica, 80(6):2543-2594. Duranton, G and D Puga (2004), “Micro-foundations of urban agglomeration economies”, in J V Henderson and J F Thisse (eds), Handbook of Regional and Urban Economics, chapter 48, pages 2063-2117. Elsevier. Fontagné, L and G Santoni (2016), “Agglomeration Economies and Firm Level Labor Misallocation”, Working Paper CEPII, No 2016-24. Hsieh, C-T and P J Klenow (2009), “Misallocation and manufacturing FTP in China and India”, The Quarterly Journal of Economics, 124(4):1403-1448. Petrin, A and J Sivadasan (2013), “Estimating lost output from allocative inefficiency, with an application to Chile and firing costs”, Review of Economics and Statistics, 95(1): 286-301. In the empirical analysis we use the zoning established in year 1990 prior to the estimation period (1994-2007) to limit possible simultaneity bias.